As one might guess The Lovers card represents union, sexuality and other forms of love. Typical symbolism includes a loving couple embraced or holding hands, a cupid firing upon them, or a magistrate adminstering their wedding. Instead of a couple we sometimes see a man with two potential lovers, showing he needs to make a choice between true (higher) love or passion. The wrong choice could lead to The Devil card. 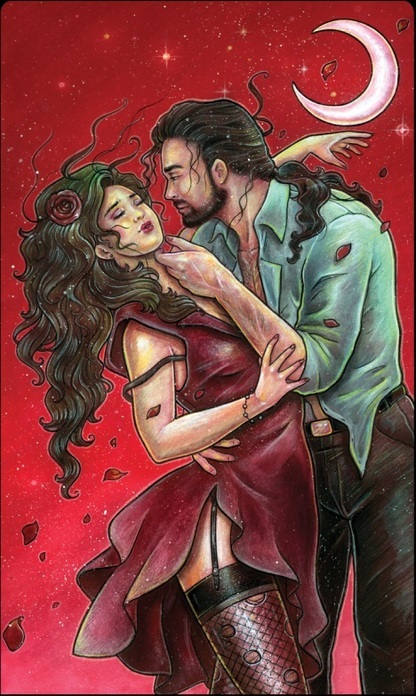 Below you can view the various artistic interpretations of the Lovers card. The Lovers are the sacred alchemical marriage. The conjoined Yin and Yang. This is the first serious work required in order to make the journey to a full life. The internal union of the opposites. A great deal of hard work is required to achieve a real partnership, to harmonize the internal male and female energies, to blend the right-brain and left-brain aspects of intelligence, and to marry all the pairs of opposites. There is no real love without equality. This is not a summer romance. Not a Camelot quest for the object of your affection. This won�t be found at the end of the rainbow. It�s not a love affair with an external partner. It does not describe a childish fantasy. This is the work of becoming a well-rounded and balanced person. Have you brought yourself into balance? What must you do to bring your male and female selves into equality? Does your masculine or your feminine side need to be strengthened? Are you ready to proceed on the journey? Will you be able to move forward?